The May 2017 State of Oregon Economic Indexes was released today. Full report is available here. We thank KeyBank for their generous support of this project. Recall that when analyzing these numbers it is important to follow the underlying trends due to volatility of index components. The three-month moving average was a solid 1.07 (“zero” indicates average growth over the 1990-present period), consistent with readings from past economic expansions in Oregon. The manufacturing sector continued its rebound with positive or neutral contributions from all components; employment and average weekly hours worked were particularly strong. Record low unemployment rates, rapid labor force growth, and low levels of initial unemployment claims all contributed to a very strong reading in the household sector. 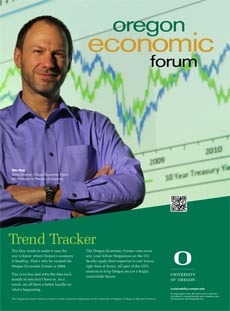 The University of Oregon Index of Economic Indicators rebounded in May, gaining 0.4%. Employment services payrolls (mostly temporary help jobs) continued to rise while initial unemployment claims remain near historical lows. This combination is traditionally associated with ongoing solid overall job growth. Residential building permits (smoothed) and the Oregon Weight Distance tax are generally tracking sideways in recent months; the former remains low compared to past Oregon expansions.